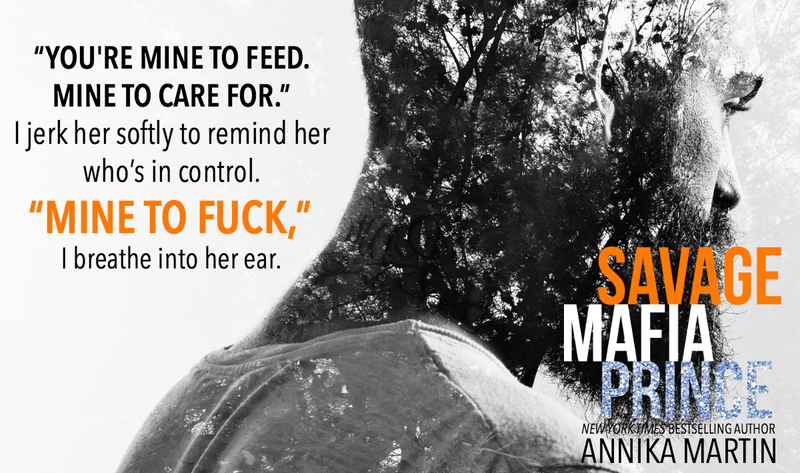 Wow, what a conclusion to this totally compelling series that Annika Martin has delivered. I love my Mafia books and this whole trilogy has been suspenseful, intriguing, intense and extremely hot. The Dragusha brothers were all totally different, separated as children and finally reunited. While they missed growing up together their similarities in temperament, their actions and their morals definitely bonded these men together. These guys don’t love easily, but when they do, they are all in. All three were intense, passionate and protective and god help anyone that endangered either themselves or their partners. Each book in this series centres around one brother while the plot lines from the very first book continue throughout the series. Dark Mafia Prince was Aleksio, Wicked Mafia Prince was Viktor and now it is the turn of, Kiro, in Savage Mafia Prince. Kiro was the youngest brother, ripped apart from his family as a babe in arms. He knew nothing of his past or his family and having escaped from the home he was placed in, he grew up in the wild, with the wolves, he was a real life Tarzan. Kiro feels at home with dirt under his feet, fresh air and wild abandon not in an asylum in a drug induced vegetative state which is where he finds himself at the start of this story. Nurse Ann is an undercover journalist who has had her fair share of stories in war zones and battle fields. She has her own demons but now she needs to re-establish herself as one of the most sought after journalists after her last job hit the skids. Hired to investigate a potential drugs ring within the hospital her nursing background comes in handy and cements her firmly in the right place at the right time. Nurse Ann has her patients and none are more intriguing than Patient 34, a young man kept sedated for the safety of the staff and allegedly himself. Patient 34 was a wild one, had no respect from any of the staff and was treated appallingly, but it stunk, and being the investigative person that she was Ann knew that there was more to Patient 34 than met the eye. Kiro a.k.a. Patient 34 was clever and cunning, he acted the part of the sedated patient but through sheer determination and strength he had found a way around his drug induced haze. Oblivious to the fact that Patient 34 is alert Nurse Ann shows him compassion and uses his lifeless body as a sounding board to her troubles and woe. She shows him affection, something that he has never had and it soon becomes apparent that Patient 34 has developed feelings he never knew existed and never knew he wanted. With Lazarus still gunning for Kiro it is only a matter of time before he is found and the race is definitely on between him and Aleksio and Viktor. Lazarus, determined to prevent the prophecy from coming true and Aleksio and Viktor, determined to keep their family together and take their proper place. But once Ann unearths the truth about Patient 34 will she be an ally or foe? The chemistry between Kiro and Ann was palpable and being the wild, caveman that he was Kiro’s actions and reactions were primal and feral leading to some rough, raw and uninhibited scenes. Finding a mate was a base instinct an act all about the release and the claiming, but Ann shows Kiro love and Annika Martin depicted this perfectly. His metamorphosis from caveman to lover was stunning. This was a fantastic culmination to an unputdownable trilogy. I have loved this series from the very beginning and to see its conclusion is kind of bitter sweet. The Dragusha brothers are certainly memorable and this will go down as one of my Mafia favourites. This is a trilogy that I can highly recommend.